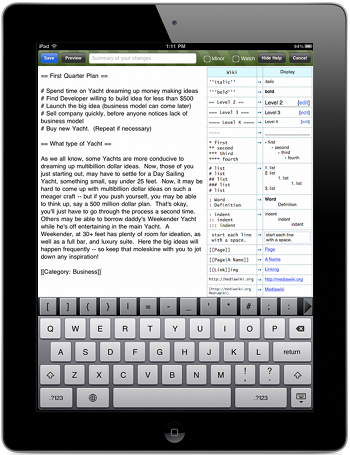 Wiki Edit is an iPad application that makes editing any MediaWiki site a pleasure. It features a fully functional web browser that automatically detects Wiki sites and enhances them with a special menu, and a beautiful full-screen wiki markup editor. More than a dozen themes for browsing and editing: Bamboo, Teak, Marble, etc. Added: Edit Recovery - tapping "cancel" during save will return to the editing screen with your changes intact. Added: Network Recovery - Your edits are saved, even during network failures during Saving or Previewing. Added: iPad generation 3 support. Bug Fix: Better memory management (now using ARC). Bug Fix: Missing activity spinners on Load/Save/Preview fixed. Bug Fix: Missing "http:" for some Wikipedia Pages in Wiki Menu fixed. Note: Some "Upload Wizards" don't work on the iPad. Try using the "Upload" option from the Wiki Edit menu instead -- this will bypass the wizard and allow you to upload on most MediaWikis. New: 12 Browser and Editor Themes: Bamboo, Teak, Marble, etc. Bug Fix: Fixes Cyrillic text editing bug. Help make Wiki Edit even better. Follow Wiki Edit for iPad on Twitter "@wikiedit", visit Wiki Edit for iPad on Facebook or leave comments on the Features or Support topics here. Apple, the Apple logo, iPhone, iPod touch, and iTunes are trademarks of Apple Inc., registered in the U.S. and other countries. iPad is a trademark of Apple Inc. App Store is a service mark of Apple Inc. Wikimedia, Wikipedia, Wikibooks, and Wikiversity are registered trademarks of the Wikimedia Foundation. Wikia is a trademark of Wikia, Inc.
MediaWiki is open source software licensed under GPL. The Wiki Edit App does not contain any code from the MediaWiki project. The MediaWiki flower and Logo are under CC BY-SA and public domain respectively. Wiki Edit is not affiliated with the Wikimedia Foundation, Wikia Inc., or the MediaWiki open source project. Da Kine Apps is a trademark of Da Kine Apps LLC Hilo, Hawaii, USA.